Reigning world champions, Golden Eaglets of Nigeria failed to progress to the final round of qualifiers for the 2017 Africa U17 Cup of Nations after losing 1-3 to the Junior Menas of Niger Republic in Niamey on Saturday. It was a highly charged encounter full of drama more on the stands as the Nigeriens in the full glare of security threw caution to the wind as they wrestled and seized the Video Camera of NFF staff, Mallam Munir Tijjani Shittu. 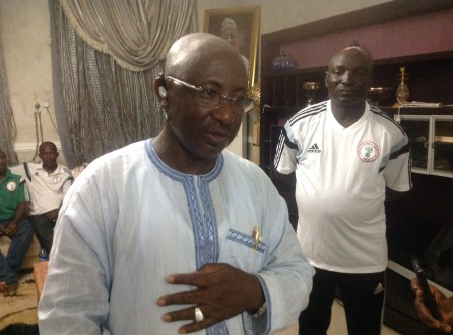 The NFF General Secretary, Dr. Mohammed Sanusi was not spared either in the VIP Box as he was badly assaulted, even in the presence of Nigeria Diplomatic officials led by Ambassador Abduljelil Sulaiman. Usman Musa Babalolo meanwhile got the equalizer with a header barely a minute to the end of first half. The second half began with much drama as the Camerounian referee Henry Duvalier Mouandjou Kalla gave the host a freaky penalty in the 48th minute, which was converted by Mamane Bello. From then, it looked like Mountain Everest for the Eaglets to climb with repeated foul calls by the referee. With minutes left to play, the host got yet another funny free kick just outside the box which was converted by Issaka Magaji. “This is a daylight robbery and cannot be defined in any other way because all the officials worked jointly and fully against Nigeria,” lamented Golden Eaglets’ assistant coach Nduka Ugbade. “What would the Nigeriens and the officials of the match be teaching their kids at home? In all my life in football, I have never seen this kind of drama but Nigerians would not be able to see the match as all our cameras were seized.